When two people consummate their love by deciding to join in union, the world is unaware of this choice. It is sacred and shared only with the nearest and dearest of those it affects. An invitation tells the world, we are ready. This invitation says to the world love is possible love is real. For Vanessa and Jim this couldn’t be truer. In a world now dominated by technology, it is rare to receive something so beautiful in the mail. The senses of touch and sight are aroused as the invitee inhales every part of the invitation, as an acceptance and acknowledgement of the love these two share. 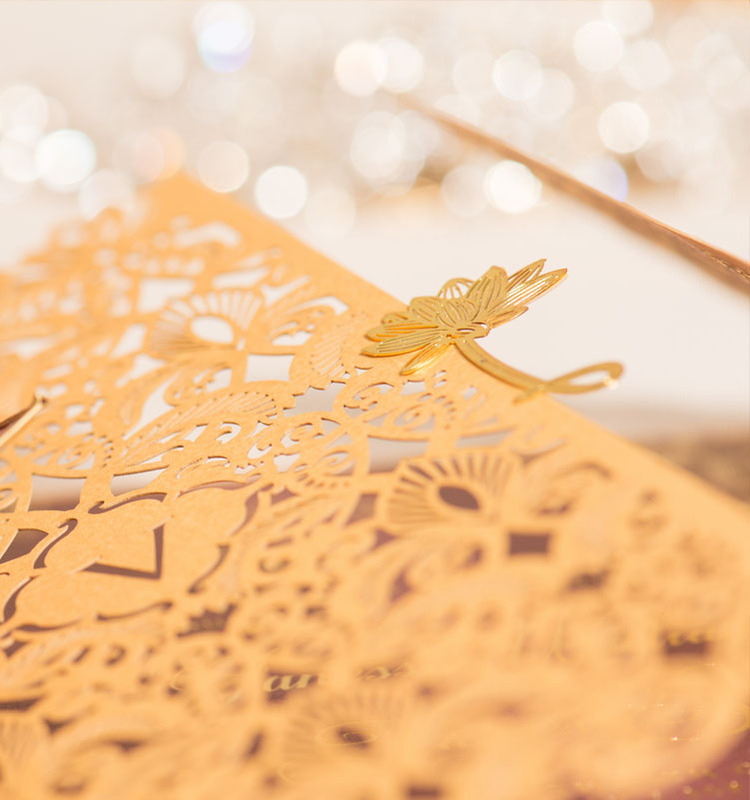 Our only points of reference were a beautiful dress, a gold theme and a shortlisted pin board selected by Vanessa. 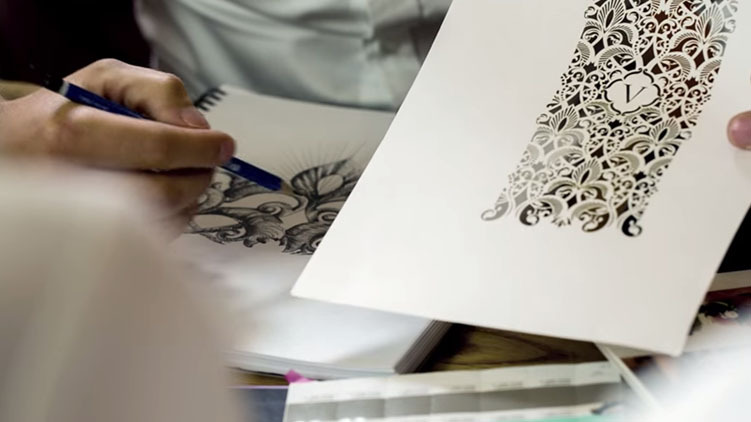 Our designers fuelled with inspiration started with hand sketches and then perfected these visuals by transferring the illustrations to screen and detailing the concept. After an intense session of brainstorming fuelled by caffeine, our creative team settled on a singular shape, that when repeated multiple times creates a seamless and unformed pattern. 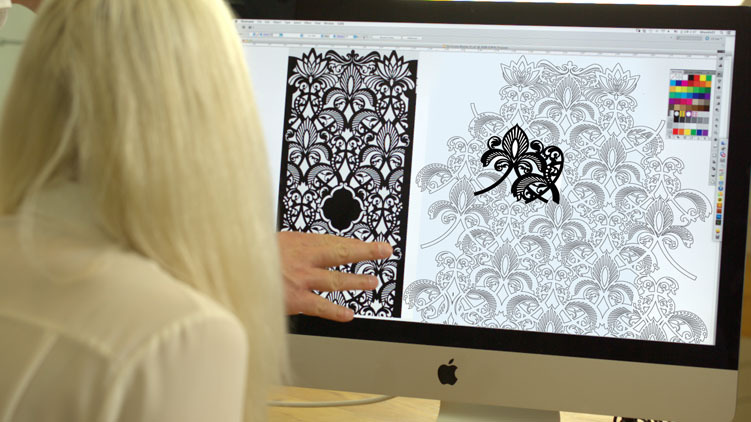 We also decided to tie in a laser cut pocket as a representation of the intricate detail on Vanessa’s dress. The intricate shape initially created a nightmare for our machine operators (due to the 586 small shapes that needed to be precision laser cut) but they turned out beautifully! The rose, beautiful in all its elements, carries the colour of Marsala on its petals. 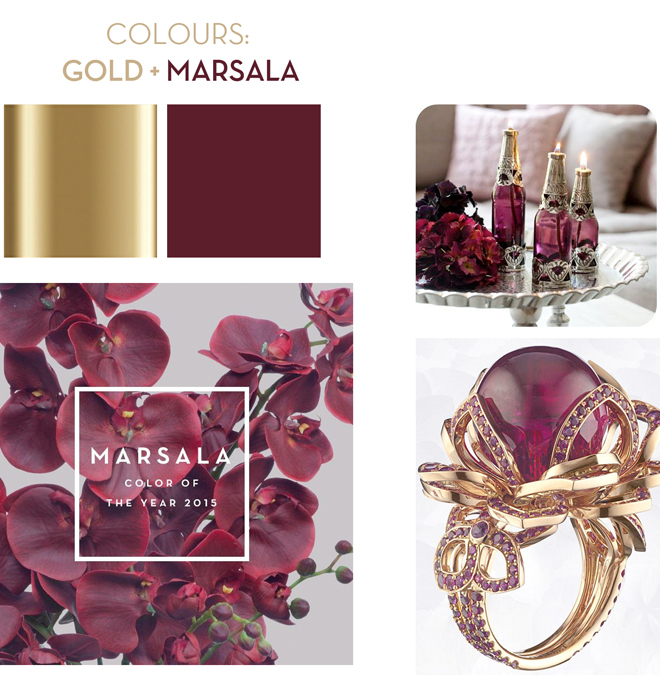 This deep and emotionally rich colour conjures the feelings of passion and romance. Naturally, this was the colour highlight Vanessa chose. Along with the gold it created lovely hues and the perfect balance we were aiming for. 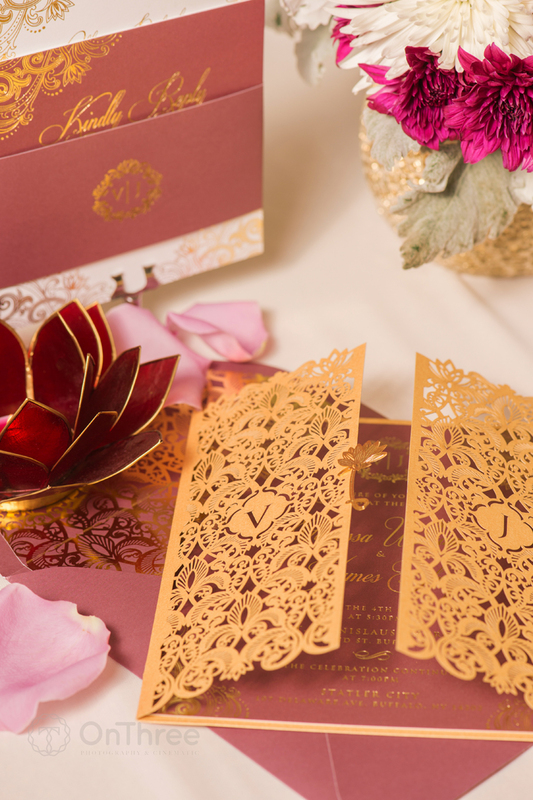 Their foreign encounter in the land of the Pharaohs inspired us to come up with a prototype, using a laser to cut gold metallic shimmer paper. 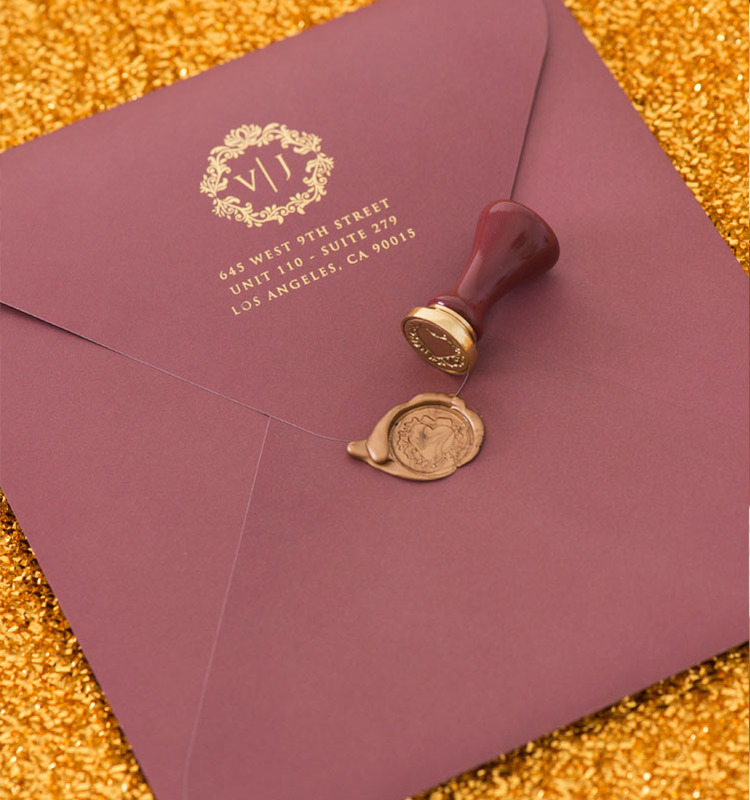 Melting the letters into the stunning Marsala paper we added a luxurious touch to these invitations by achieving a gold foiling for the lettering. Carrying on the theme, our design team fashioned a personalised logo for Vanessa and Jim, used in all the associated stationary. We then carved out the couple’s initials, adding that beautiful yet personal touch. 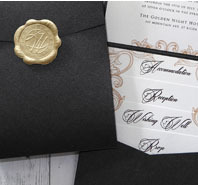 Our next step was to craft an envelope worthy of these invitations. The sensation of peeling back the envelope of an invitation to a loved ones wedding conjures images, emotions and excitement. 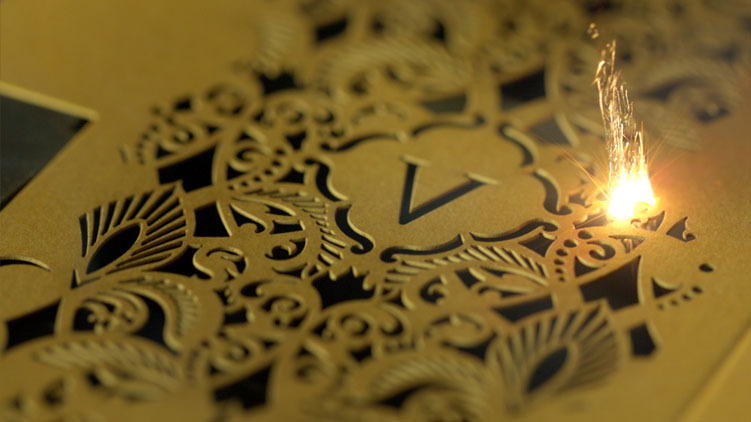 The custom crafted gold lining of Vanessa and Jim’s invitations, pressed with a wax stamp, was the perfect way to present a love such as theirs. Finally, we needed a symbol. Something that would represent this couples journey. The lotus flower grows in murky waters but, despite these conditions, rises to the top and blooms more beautiful than ever. It is a symbol of fortune and of purifying the sprit and nothing could be more akin to love. Despite the difficulties life may have delivered, Vanessa and Jim found one another and made their love work. Their love bloomed just like the lotus flower. 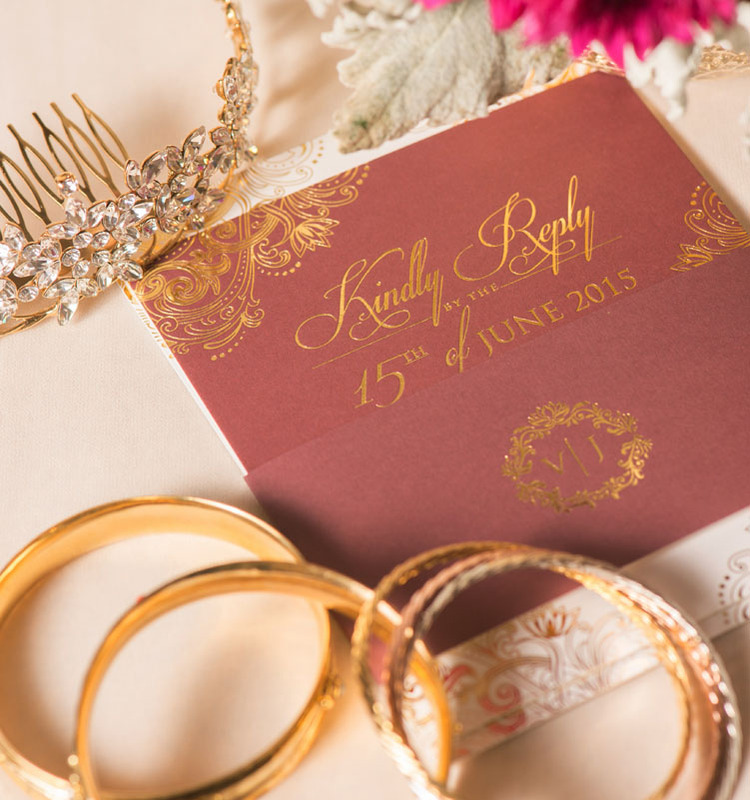 This made it the perfect symbol and finishing touch for this couple’s invitations. The lotus was plated in 14 carats of gold to represent the enormity of their romance and each flower was hand applied on a gate that also served as an enclosure device. After an amazing 3-month journey of design and production work, we were finished and the result was truly amazing. As Vanessa said to us, we did “extraordinary work in creating a beautiful piece of art” that we felt best represented their love.